After sitting for several years, we are getting off of our asses and are working on getting a decent bump in power on Project Mitsubishi Evo IX. In our last story, you probably read about the modernized Link plug and play stand-alone engine control unit that we will be running. In this edition of Project Evo IX, we will be adding some engine parts to enhance our car’s power while keeping its great driveability intact. When we were young, we were always looking to make the maximum amount of power, this usually meant big laggy turbos. These turbos were happy at higher boost levels which required race gas. At boost levels that were safely obtainable with crappy pump gas, the big turbos were both sluggish and soggy without that redeeming rush of power when in the powerband. The stock Evo IX turbo is pretty decent, it is quick spooling with a twin scroll turbine section with a pretty efficient compressor. Our car was able to make pretty decent power with the stock turbo with little lag, the car would pull well from 3000 rpm to its 8000 rpm rev limit without any drop off in power. In fact, the car’s knock limit was what seemed to be holding the car back from making more power as we tapered the boost to reduce knock at high rpm. Our car was zingy and responsive making it very fun to drive. We wanted more power of course but we didn’t want to give up any of the cars fast spooling nature. This is especially true when compared to modern direct injection high compression turbos! Modern turbo engines spool really fast thanks to higher compression ratios and the ability to take a lot of boost at low rpm without detonation caused by the cylinder cooling of direct injection. So we are going to proceed but we are not willing to give up bottom end or response for more top end power. The first order of business was to get rid of the stock intake manifold. The stock 4G63 intake has a really small plenum with the runners close to the plenum walls. This is not a good way to make power whether it be in a NA or turbo motor. We are not sure why Mitsubishi designed the manifold like that, perhaps for packaging reasons. Based on results with other engines, turbo engines seem to like a larger plenum volume, we decided to change our intake manifold. We obtained a Hypertune 4G63 intake manifold from Australia having formed a relationship with them when we were there for WTAC with Team America a few years back. A few emails later, we had a beautiful Hypertune intake manifold for our Evo IX in our hands. The Hypertune intake manifold has CNC machined billet aluminum flanges and intake runners with a hand fabricated tig welded sheet aluminum plenum chamber. 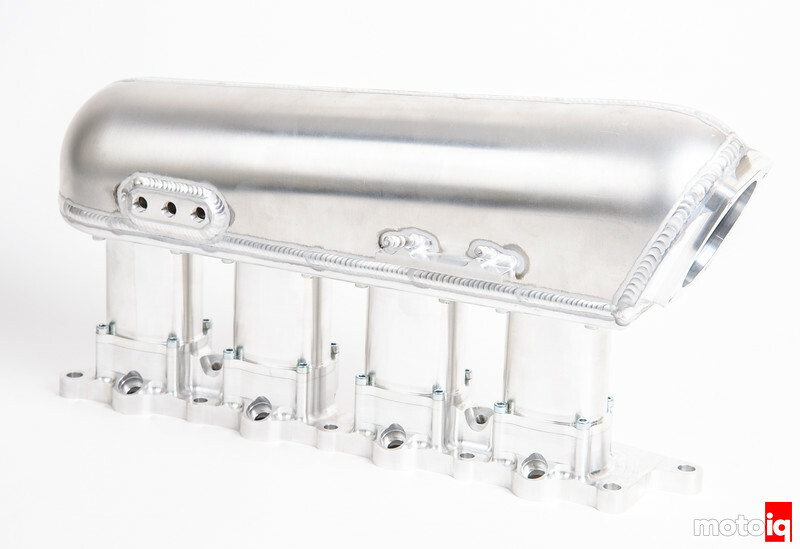 The Hypertune 4G63 intake manifold has a large plenum that is at least 2x more volume than stock, this gives plenty of room around the ends of the intake runners for better air distribution and less interference of wave tuning. The ends of the runner have velocity stack trumpets for good flow. 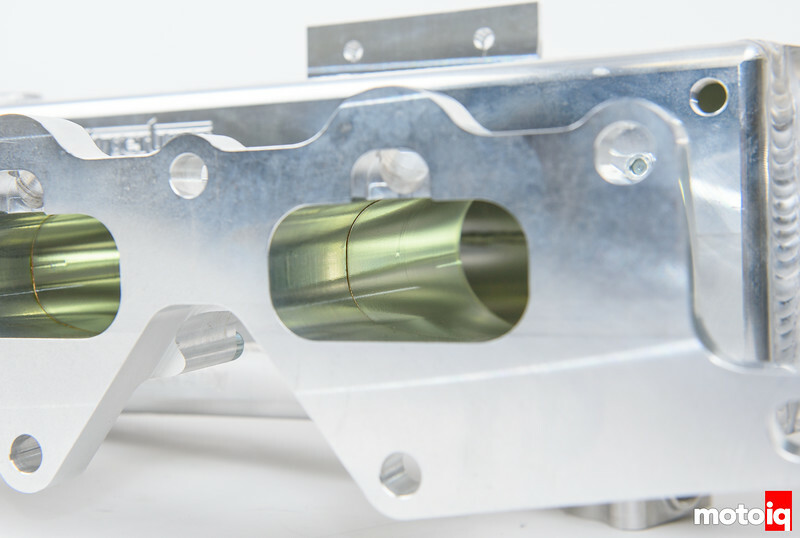 The CNC machined runners have a perfect fit to the flanges and intake ports. CNC machining assures a perfect match with runner length and volume. The Hypertune manifold has runners that are straight and significantly shorter than stock. This might cost us a little bit of bottom end but should help top end power. Turbo engines are less sensitive to intake manifold runner length than NA engines so this should not be much of an issue. You mentioned that your experience is turbos liking a bigger plenum, but how big do you aim for? Is there such a thing as too big? A good rule of thumb is 1.5 times the engine displacement. Too big results in poor throttle response and lag. Great, thanks! The one I’d already planned to use is 1.45 times displacement, so that’s awesome. Some other stuff if you can package it is to make your manifold walls nonparallel and try to have 4″ from the end of your intake runners to the opposite wall of the manifold. Most of the time you don’t have room to do this well but its good to shoot for it if you can. That’s awesome info. I’m not sure about the gap from runner to wall because I haven’t started the build yet, but the pictures look like the TB end may be around that. So I’ve heard of big intercoolers and long piping causing a perception of lag as it takes time to pressurize all the volume, despite the turbo already at full chat. Would a bigger manifold also contribute to that feeling? Granted, the volume seems much smaller than big IC’s and piping. You are correct. Too big of a plenum would do that. A general rule of thumb is a plenum 1.5 times the displacement of the engine but there is usually not enough room to do even that. Have heard some say larger throttle bodies might make it less driveable, and harder to modulate power. Been involved in building a mild 2jz with wide powerband and early spool, we used a lesser quality manifold looking like the hypertune (didn’t know of them then) and a 90mm throttle body, would there be any benefits to going smaller or bigger? I know with a Turbo engine that having a really big throttle body results in a poor ability to modulate the engine output like there is almost no difference between 1/2 and full throttle. Some of my friends in Pro Drifting have gone to smaller throttle bodies for this reason. While I no doubt think that JDM turbos (HKS, Trust, Tomei) are of good quality, I cant help get the impression that they’ve been “left behind” by USDM brands, namely by Garrett and Precision, in terms of tech and innovation. Recent JDM turbos just seem to be an “updated” version of pre-existing turbos all the way back as early as the late 90s. And the recent rumor in reddit that Tomei and HKS dont make their turbos in house anymore. No doubt that an upgrade over stock is always good specially if its just found lying around! but yeah, just cant help get that impression with JDM parts in recent years. I agree with you. When this turbo came out as it was groundbreaking being ball bearing, OEM fit and reverse rotation. Now the aero is dated but I still think it is one of the best direct drop-in OEM replacement turbos for this car. 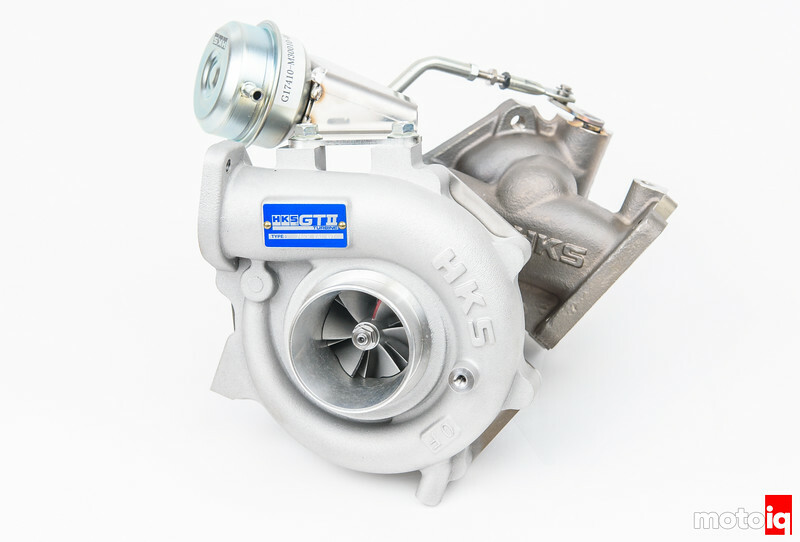 I mean, a lot of the older HKS turbos were Garrett CHRAs in custom housings, and on their site they’re outright saying that the GTIII series are Mitsubishi CHRAs though it’s not easily apparent which series. Greddy/Trust and Tomei were always Mitsubishi CHRAs too as far as I know, and again as far as I know are still using some of the pretty old families. In bolt-on Subaru sizes for example, a Trust T518Z is a TD05-18G, and a Tomei M7760 is a TD05-20G. Tried and true, but not too new. But then again as far as I can tell, the McLaren MP4-12C came with TD04s so it’s hard to come down too hard on the TDxx MHI turbos. Interested to see your results with the large Hypertune intake manifold. The stock Evo IM has proven to be very efficient and most aftermarket manifolds lose tons of mid-range on sub 700whp setups. Ported versions of the stock manifold have supported high power setups. Looking forward to the HKS turbo and E85 results as I’m planning a similar build. Mitsubishi doesn’t make ball bearing center sections. It looks Garrett but Garrett severed their relationship with HKS some time ago. The results I have seen is a slight loss in mid-range. Back in the EVO VIII days we cut off the plenum of the stock manifold and welded on a crude bigger one and saw 40 more hp on the top on a mild bolt on motor with no cams with no other changes. Your articles are great and the stuff you bring to the community is amazing. I am just confused why you choose some of the mods you do. There is endless R&D by the Evo community already. I guess there is definitely an upside to new content and it will be interesting how that manifold performs, especially with the velocity stacks at each runner. Then with the turbo selection, I’ve read tons of articles and it seems the reason people choose FP turbos is because they work well when utilizing stock location. From looking at turbo after turbo for stock location, FP seems to have the best and most reliable. There definitely are better, newer / more advanced turbos but they all require new custom hot parts and LICP. There is also apparently a reason that there are a lot of the HKS GTII Turbo’s happen to be “laying around”. Any extended track use has apparently lead to EGT’s climbing, flapper arms loosening and destroying the turbo, and they’re reported to be difficult if not impossible for servicing / rebuilds. From the way people talk about the HKS GTII on Evom, its like strapping a $2000+ grenade to the engine. Hopefully you can share some good results though and have good luck tracking the car with the turbo. Any chance you can get numbers with just the IM change then add the turbo after? A long time ago, I was doing some dyno testing for a now-defunct magazine on 4G63 intakes and the Hypertune came out on top of the 3 I tested which were stock vs modified stock, vs Skunk vs Hypertune, I was going to do more but the magazine went defunct with the publishing group owing me a bunch of money. Me getting pissed at them for stiffing me is a big reason why MotoIQ is around today. The car was my Blue Evo VIII. Stock turbo and cam. The Hypertune had the most top end sacrificing a little mid-range, the skunk was decent all around and the modified stock manifold was good all around too. The modded stock manifold had the plenum cut off and a larger fabricated plenum welded on with ported runners. So the Evo IX has variable cam timing, Cosworth M2 cams, and a ton more midrange and bottom end than the VIII did so I think the Hypertune intake might do pretty well. I had the Skunk on there and the results were not as good as the close to stock VIII. I am not sure why the Skunk had so so gains on an engine that is cammed out with a better turbo. I am thinking that the variable intake timing makes the engine less sensitive to intake manifold tuning. That still doesn’t explain why the engine didn’t respond much to a larger plenum volume. So that’s why I choose the Hypertune, I had it, haven’t run it on an Evo IX, the Skunk didn’t do much on this engine, my modified stock manifold was on the Evo VIII when I sold it and the Hypertune looks cool. I also don’t listen to forum people much because much of the time, I feel that their testing and tuning are flawed. As for the turbo, message me on FB messenger if you want details why I used this turbo vs FP. 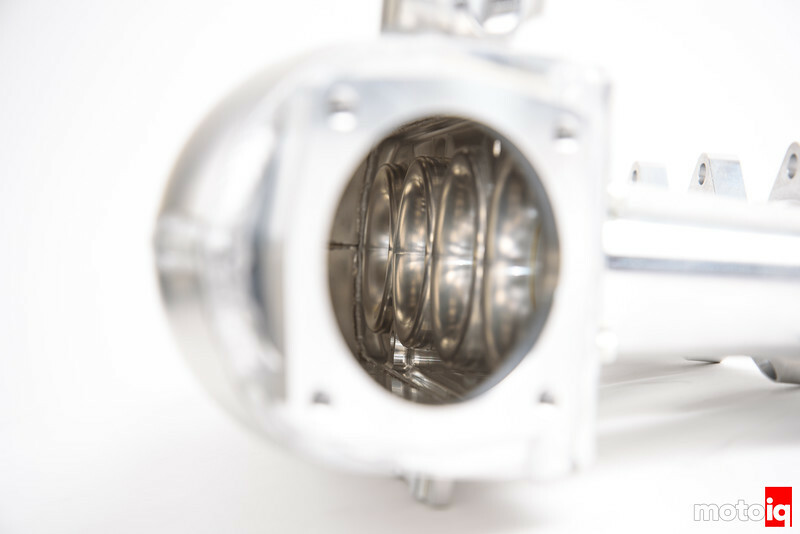 The HKS uses am OEM level CHRA and housings cloned off of housings designed for the wheels used. The turbo is reverse rotation so at the time the wheels on the market were all aftermarket. I doubt this turbo causes EGT’s to climb. That is a fault of the tuning which in the Evo market is all over the place. In any case, the turbo would cause less of an EGT issue that the stock turbo. High EGT’s are caused by compressor to turbine wheel size mismatches, too small of a turbine and a big turbine carved into a way too small exhaust housing being forced to run at high power levels. One thing about this turbo, it is critical to run water to it as it’s bearing separators are plastic, like Garrett and can get damaged if the CHRA is run dry. That could be another reason why there are failures.